An extension of the Department of Athletics’ motto of “Education Through Athletics,” the Weapons of Mass Construction (WOMC) program is a way for undergraduate student-athletes, coaches and administrators to give back to the region. Founded in 2009, the WOMC program has seen more than 910 volunteers dedicate over 4,500 service hours to the community. The Princeton Varsity Club has partnered with several non-profit organizations as part of the WOMC program over the past five years, including HomeFront, Community House, Isles, Inc, the YMCA of Trenton, the United Way of Greater Mercer County, and Jersey Cares. Projects have included building community gardens, restoring hurricane-damaged properties, refurbishing community centers and renovating the future site of a sustainable urban village. In response to the greatest tri-state natural disaster in recent memory, 60 student-athletes volunteered in the spring of 2013 as part of the rebuilding effort on the Jersey Shore, working to help restore seven sites, ranging from homes to high schools, from Toms River to Mantoloking, that were damaged by Hurricane Sandy. 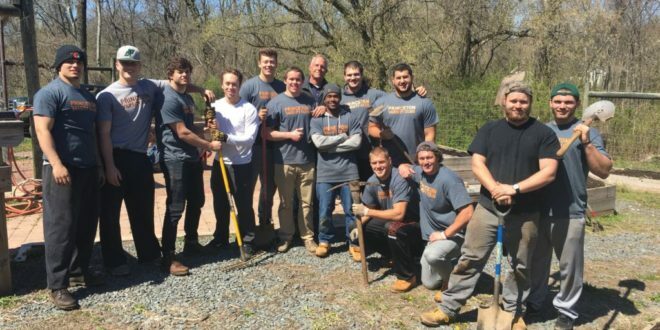 Most recently, more than 50 student-athletes helped prep Princeton area gardens for spring planting, while others helped facilitate a Mother’s Day Picnic for low-income families in the greater Princeton area. An archive of WOMC videos, photo galleries and feature stories can be found below.